MIILLE APPLIED RESEARCH COMPANY, INC. 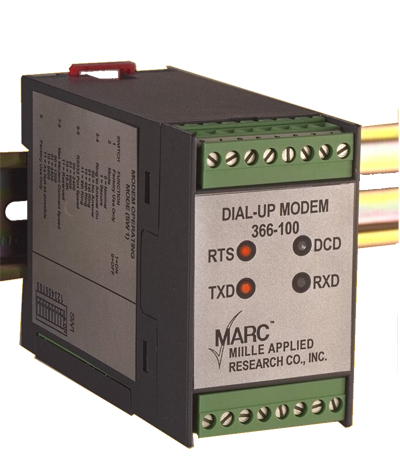 The MARC™Model 366-100 is a full-function dial-up modem that mounts on a standard DIN-rail and provides data communications with other Bell and CCITT compatible modems at speeds up to 33.6K baud. This modem provides convenient terminal compression screw hook-up and clearly marked, easily accessible switches for quick and accurate operating mode configuration. Flexible and low power requirements, compact size and DIN-rail mounting make the Model 366-100 ideal for providing long distance dial-up data communication capability for PLC and other intelligent devices. Miille Applied Research Co., Inc. Contact Miille Applied Research Inc. The Miille Applied Research logo is a trademark of Miille Applied Research Co. Inc.